Is Andy Murray living the dream? When is a dream job not a dream job? When it’s not fulfilling your dreams. Andy Murray’s startling admission that he no longer enjoys playing tennis might be construed as a knee-jerk reaction to his early exit from the Sony Ericsson Open, but I prefer to think of it as one the most honest admissions from a sports star that I’ve ever heard. But how can he be sick of tennis? He’s living the dream. A highly paid wealthy young man, regularly ranked among the top four in the world, who travels the globe being feted wherever he goes, staying in the best hotels in the best locations, and his only obligation is to hit a furry ball over a net more often than the other guy. What’s not to love? Well, on the surface, I’d agree with you. From the outside, the life of a top-class tennis player does seem like a fantasy camp. But as one who’s glimpsed it from the inside, as a journalist not a player you understand, I can somewhat appreciate how these superstars might become disenchanted from time to time. Here at World Sport for example, we often conduct interviews via satellite. But what you don’t see at home is the interviewee doing a string of interviews before and after ours, with each one needing to appear fresh despite the fact that they’re being asked similar questions over and over again. A recent interview with the Williams sisters springs to mind in which everything about their off-camera body language suggested they didn't want to be there. To their credit, that didn't show on camera, and that's what matters. But it did offer a glimpse into their world, where there's a never ending need to be “on”. Then there’s life on the road, where, never mind the travel and the desire to climb into bed after a long flight, the players often have to get down to business right away, as matches and practice times are obviously arranged in sync with the locals not the visitors. Can you imagine how wearing that must be? Plus, there’s the routine of it all. Apart from the training, and I’ve heard of few players who like training, there’s the sheer number of tournaments you have to play. Sure, every player can get up for the slams and some of the Masters events, but they are not your bread and butter. And I can’t believe your umpteenth trip to the "Back of Beyond Open" can be that inspiring however much you’re being paid. But, like the office worker dragging himself out of bed and onto the subway on a Monday morning, you have to deliver because that’s what you bought into by going pro. Finally, there’s the constant need to explain yourself. If you win, why did you win? How do you feel about winning? Can you win again? What about Roger, Rafa, Novak etc. Can they be beaten? How can you beat them? Yada yada, yada. And it gets even worse if you’re defeated. In my experience, a post-match news conference is like self-flagellation for the loser, requiring a player to beat themselves up in public and explain every missed step. 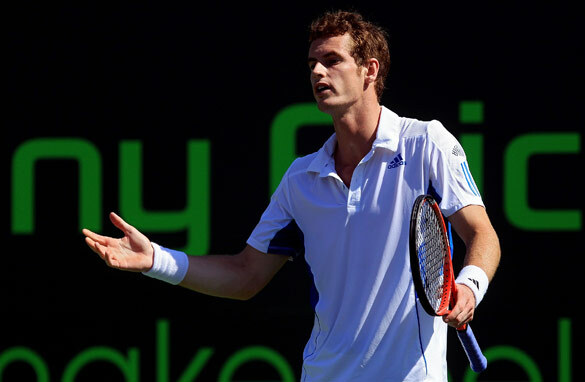 “So, Andy, how do you feel after that triple bagel?” Aaargh! Of course, there’s no such thing as a free lunch, and the price of success and fame has to be paid. But I can’t help but sympathize with Andy when he says that he’s “temporarily” fallen out of love with the whole shebang. He's not a miner digging coal, of course, but tennis is his job, and it’s impossible to love your job all the time. Well, apart from my job that is. Now I AM living the dream. Except that……well, maybe that’s best left for another time. His a great man, i think he needs a rest at least for now. He is a great man & he surely deserves to be one of the top 5 players...it just that he is unable to focus mentally & sooner he'll recover from that.....KEEP IT UP ANDY MURRAY....WE ARE ALL WITH YOU!!!! Best of luck 4 your upcomin clay court tournaments....Hope 2 see you winning ATP 1000 Masters in Monte-Carlo!!! fame comes at a price. the constant traveling, practising day in/out and answering the same stupid questions at interviews must be unnerving. the flipside is the money earned. How many times havent we heard the cliche that "I dont need the money". Easy for them to say after they have become rich beyond their dreams. If the players didnt go through the grind to better themselves they wont be earning the money and fame they crave. The choice is theirs to make. I dont feel sorry for them. As for Andy, well if he is tired he can afford to take a sabat year – or several if he wish.